Maris ii holding the original tee shirt she designed at age 14. My name is Maris and this is a true story. I love animals, and I thought it was mean to step on ants or bugs. When I was in first grade, I organized a group of friends to pick up earthworms in the schoolyard after it rained so the boys couldn’t step on them. We saved a lot of worms. In the fourth grade, when I discovered snails with broken shells, I would carefully pick them up, put them in a terrarium and feed them greens so they could recover. Some of them actually did recover. They would break out of their enclosure and make slime trails up our walls! We always had pets at home; I had cats, fish, a turtle, newts, lizards, and a dog. I wanted to be a veterinarian. When I was 14, I took a plane trip from Los Angeles to Boston. On the flight I read an article in the airline magazine written by Joan McIntyre, the director of a nonprofit organization called Project Jonah, located in Bolinas, California. The article contained a story about a pregnant blue whale that had suffered on a dock for several days before dying. The story upset me deeply. I never realized that whales were mammals like we are, or that they cared for their babies for a long time and spoke different languages. I felt people had to know what was happening to the whales. 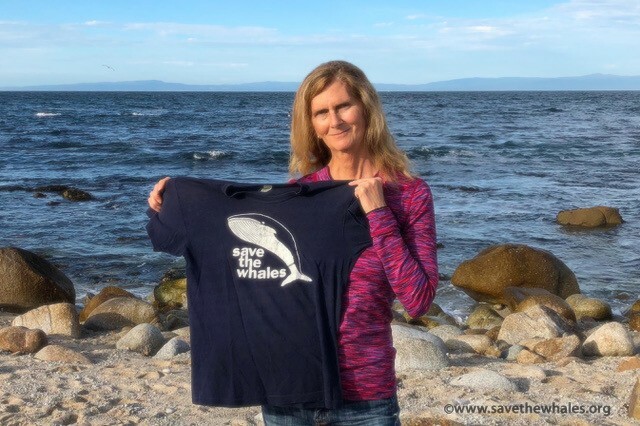 I designed a T-shirt with a blue whale on it and three simple words: “Save The Whales.” I had no idea that this T-shirt would change my life. When I returned to Los Angeles, I took $50 out of my savings account and had a dozen T-shirts printed. I gave these T-shirts away to friends and family, and people started asking how they could get one. My mother and I began selling T-shirts through Rolling Stones magazine and donated our proceeds to Project Jonah. I was asked to appear on a local TV program to talk about the cause. I was then invited to appear on several other local TV programs. We started attending animal rights fairs and other street fairs, selling “Save The Whales” T-shirts and handing out literature. In 1977, when I was 16, Save The Whales became a 501(c)(3) non-profit organization. I still lead the organization today with my mother. The mission of Save The Whales is to preserve and protect the ocean and its inhabitants. For 40 years we have stayed true to our purpose. We believe education is the key to saving the whales, the oceans, and ourselves. To date, Save The Whales has educated over 316,000 students through our hands-on school programs. When I was 16, my mother and I signed up for a trip to see orcas in the wild and help researchers. We went to Orca Survey headed by whale scientist and photographer, Ken Balcomb, in the San Juan Islands off the State of Washington. He had been studying orcas from his home on San Juan Island for several years. Whale researchers in Canada had discovered that each orca could be individually identified by the unique saddle-patch patterns behind its dorsal fin and by the dorsal fin itself. Students and researchers would photograph each whale, identifying each orca and following its life progress, sometimes from birth to death. We spent a lot of time with the wild orcas and, in one encounter, stayed with them for 28 hours. This experience solidified my desire to become a marine biologist. I went to college at Humboldt State University in Arcata, California. and studied marine biology. After my freshman year, I heard that a Humboldt student was studying orcas during the summer in Canada and needed assistants. I signed on and traveled to the northern tip of Vancouver Island. We worked with Dr. Paul Spong who recorded the sounds of orcas with his underwater array of microphones. I learned how to photograph orcas in the wild from a zodiac, record data on the orcas’ behavior, and to record orcas vocalizing underwater. I came to understand that orcas’ lives revolve around their family units. They never leave their family, and it is only due to death or capture that they are separated. They have distinct personalities and are curious and playful. I was never afraid of the orcas. After such an amazing experience living with orcas I decided to take time off from college and go on a six-week research study looking for humpback whales in the Caribbean. I felt it was an opportunity I had to grab. Regina Maris was an old Barkentine tall ship that had been transformed into a classroom at sea. Each student was required to take four-hour shifts and do his or her part to keep Regina on course. In addition to looking for humpback whales and other whale species, I took classes onboard in marine biology and navigation, learned how to furl sails, and earned college credit. In 1986, I got my bachelor’s degree from Humboldt State University with a double major in marine biology and zoology. I then worked at the Catalina Island Marine Institute on Catalina Island off the coast of Southern California. I taught groups of school children from all over the western United States about marine life in a hands-on approach. I discovered what an impact this type of learning made on students and knew that this method was the best way to inspire students. In 1988, Save The Whales opened an office in the Los Angeles area. At that time schools were no longer able to provide field trips for students due to budget constraints. Save The Whales developed an innovative hands-on program called “Whales On Wheels (WOW) which we brought to hundreds of thousands of children all over the Los Angeles area in English and Spanish (funded through the Motion Picture Industry). Since its inception in 1988, WOW has traveled all over the country, visiting school children in Alaska, Oregon, Washington, Illinois, Indiana, Ohio, Michigan, Virginia, and California. The program is now based in Monterey County, California. We also financed a boat out of Los Angeles to rescue marine life trapped in nets and fishing lines. We collected a large amount of permitted whale, otter, and dolphin bones, otter pelts and turtle shells from the California Department of Fish and Game. These artifacts had been confiscated from dealers and people attempting to bring whale vertebrae or other artifacts across the border from Mexico or other countries. Students were allowed to touch these artifacts and ask questions about the marine animals. Over the years, I have made many TV appearances on behalf of Save The Whales on local and national programs speaking on whale-related issues. An issue that is particularly important is to prevent the captivity of marine mammals. We also tried unsuccessfully to prevent the capture of dolphins off the Southern California coast by the Shedd Aquarium of Chicago, Illinois, but we did help get captive dolphins removed from Knott’s Berry Farm in Southern California. We worked hard to get Keiko (Free Willy) removed from a small aquarium in Mexico; it was very a disheartening and frustrating saga. He was eventually moved to an aquarium in Oregon – not the plan we worked on – but at least he was moved out of the unhealthy and small aquarium in Mexico where he had been held. We also worked with Dr. Spong in attempting to get Corky out of SeaWorld in San Diego. He has studied her family pod for 30 years and continues to work on getting her back to her home and family in Canada. When I was 28, I had been feeling poorly for some time and was being treated by a doctor for what was believed to be giardia that I could have gotten while visiting the Galapagos Islands. I was getting sicker and sicker and left my job at Catalina Island Marine Institute. I went to a Kaiser Hospital Emergency Room to see if they could determine what was wrong with me. The doctors said I had a large cancerous tumor in my colon. I could not even leave the hospital, and surgery was scheduled during Thanksgiving week. After surgery, I had chemotherapy for a year. During this period, I continued to work at the Save The Whales’ office in the Los Angeles area. I also made several television appearances throughout the year. In particular, Hard Copy did a segment on my life working on saving whales and contracting cancer. At this time, it was discovered that beluga whales in the St. Lawrence river of Canada were dying of cancer. Chris DeRose, the founder of Last Chance for Animals, produced the Hard Copy animal-people segments. He became a friend who has worked with us on various animal issues. The biggest effort of Save The Whales was without a doubt our battle to stop the Navy from performing “ship shock” tests in the Channel Islands Marine Sanctuary, a biologically sensitive area off the coast of Southern California. These waters are home to blue, sperm, fin and humpback whales, as well as dolphins, seals and sea lions. If the U.S. Navy had been allowed to go ahead with its plans – which were to test the hull integrity of its new cruisers by detonating 270 underwater explosives over a five-year period – it was estimated that hundreds of thousands of these beautiful animals, as well as other marine life, would have been killed outright. Others would have faced a slow lingering death from damage to their internal organs and hearing. The government held public hearings in Long Beach, and we got various animal and marine mammal groups to make statements or provide us with written statements that could be read at the hearing. Unfortunately, the government had made up its mind prior to the hearing, so it was no surprise that the Navy was given the go-ahead to perform their tests. One of the reasons they gave at the hearings was that it (a sanctuary) was a convenient location for them. We contacted Natural Resources Defense Council and they agreed to take on the case. They obtained a high-powered Los Angeles legal firm to assist. But before our case could be outlined, we had to obtain a PhD expert for every animal mentioned in the written statements. We also had to have a scientist who was an expert in the field of bioacoustics. We called every expert we knew. Many of them sympathized with our position, but the government funded them or their marine mammal research and they could not take a public position. After a week, we had run out of options in the United States. With less than two weeks until testing began, Hal Whitehead, PhD, a Canadian and the world’s foremost authority on sperm whales, agreed to testify. After he joined us, other experts came on board and miraculously we had what we needed. The Navy had failed in its obligation to protect marine mammals, that it hadn’t prepared a full environmental impact statement, and that it hadn’t investigated all reasonable alternative sites and properly mitigated the impact of detonations on marine life. One detonation would be allowed farther offshore with observers of our choice, including airplanes, and instruments would be used to detect any deep-diving marine mammals. After this victory I was totally burned out and so was my mother. It was time to move on. I moved to Monterey County, California, where Save The Whales continues its focus today on education. Other instructors work with me to bring WOW to Monterey and Santa Cruz Counties. We also have a water quality monitoring program. I have put this information up on our website because of many requests for information on becoming a marine biologist, particularly from young people who want to study whales. There are many areas that an individual can work in: education, research, water quality, writing, underwater photography and television, to name a few. If you are an artist, you can make that your focus; art is another love of mine. I worked with the artist Wyland when he created the world’s largest mural in Long Beach, California. You have to work with your talents and your own desires. The most important piece of advice I can give to all future marine biologists is to volunteer in the field you are interested in. As you can see, my early interest in volunteering and working in the field gave me a unique experience. Volunteering will give you valuable experience that will help define your interests and help you meet professionals. The other advice I have is to never give up on your dream. I am not an ace in math or chemistry. I struggled daily with these subjects in college. One advisor told me I should switch my major because I was not strong in math. I switched my advisor instead. This advisor had no idea who I was or how much becoming a marine biologist meant to me. Follow your convictions. I knew I could do it because I was motivated and focused. What keeps me enthused is interacting with students and the thoughtful letters and questions from students all over the world. I have hope that the future generations will protect the planet, the oceans and whales, and that my story will inspire other young people just as the Joan McIntyre article on Project Jonah inspired me.